Kalyana Laxmi Scheme - Shadi Mubarak Scheme in Telangana State: Telanagana government has brought to the knowledge that there is a system for issuing the Kalyana laxmi regarding and also mubarak for unmarried girls Shadi. Telanaga government has made the right step forward by providing the money to help the girl's parents to marry their daughter. It is the dream of all parents who marries her child at the right time to the right person. Marriage is an important part of life for every individual, the difference is only the rituals that are followed in every religion. It will be the dream of every parent that their daughter married to rituals and traditions. The girl's wedding should be on or after October 2, 2014. The income of the parents of unmarried girls should not be more than Rs. 2,00,000 / - per year. Photocopy of the passport books first page, which should have the photo and the name of the bride. Letter from the Gram Panchayat / mosque / church / any other authority who performed the marriage, to be scanned and uploaded. How to apply for Shadi Mubarak and Kalyana Laxmi Scheme in Telangana State? 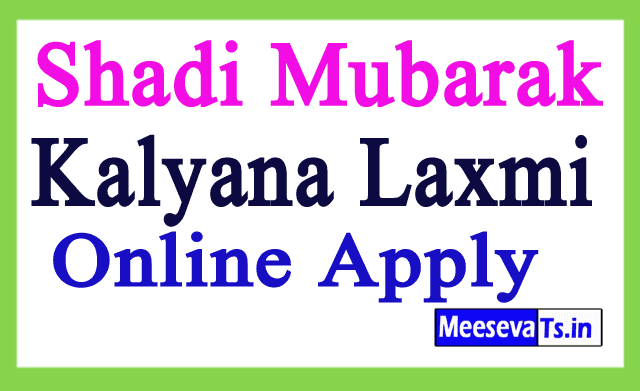 The person who is willing to apply for Shadi Mubarak and Kalyana Laxmi scheme, visit the website, which is https://telanaganaepass.cgg.gov.in. Individuals should look for Shadi Mubarak Scheme on the website and then click on it. It will be shown a page on the screen, which provides the individual with the application form, the individual has to fill the application in the prescribed format and get the pressure out of shape. The term of the form should be submitted mentioned above with all required certificates and should be given at MEESEVA-center or the Tahsildar Office.